Trooper Jerry Corcoran of the State Police sauntered into the shop of the Model Garage one mild winter afternoon. Giving Harry, the grease monkey, a playful poke in the ribs and grinning cheerfully at Gus and at Joe Clark, he perched himself on the end of the workbench. "Seen any suspicious characters around lately, Gus?" he asked. "Not a one -- except Joe here, and Harry," Gus told him. "I always keep an eye on both of them." Jerry said. "Or any suspicious cars, Gus?" Gus jerked a thumb toward a blue sedan. "I'm suspicious of that one," he said. "I suspect it's got a bad case of steering trouble." "Steering trouble!" Interest edged the trooper's voice. "Who's car is it?" Gus laughed, "Henry Miller -- you know him -- pays the repair bills on it. And he pays plenty! His wife drives it, and she can do more and worse things to a car in a shorter time than any other woman I've ever seen." Jerry fished a package of cigarettes out of a pocket of his tunic and lighted one. Then he looked hard at Gus, tilted his head toward Harry, and winked. Gus took the hint. "Darned if I'm not all out of pipe tobacco." He remarked. "Hey, Harry -- do me a favor, will you? Hop on your motorcycle and go down to Kerr's and get me a half-pound can of 'Delight.' Here's the money." Harry went out, and they heard him roar away down the road. "Well, what's on your mind?" Gus asked the trooper. "Just among the three of us," Jerry said. "Right?" Gus and Joe nodded. "You fellows know Silvio Scarpati? Italian -- about forty five -- weighs close to 300 pounds. "Yes, I know him," Joe Clark said. "He comes in here sometimes. Always pays cash." Gus nodded, "Not a bad sort of fellow," he added. "We haven't got anything against him," Jerry said tolerantly. "He used to be a beer runner, and made a pile out of it, but that's none of our business now. After repeal he bought ten acres with a house on it over on the dirt road, about a mile beyond Griggs's store. He's never done a lick of work since he quit beer-running just sits around all day and gets fatter and fatter." "Well, that's his privilege, if he's got the money," Gus said. "Sure it is," Jerry agreed, "the trouble is, he's been snatched." "Snatched!" Joe Clark exclaimed. "You mean kidnapped?" Jerry nodded, "Last night, after it stopped raining -- say about three o'clock this morning. Silvio's wife and kids were down in New York, visiting her people. The hired man -- he sleeps in a shack back from the house -- says he heard a row, and a car drive away. Plenty of signs of a scuffle in the path in front of the house. Tire tracks in the dirt road -- made after the rain stopped." "That's too bad," Gus said. "But why are you so steamed up about it? Kidnapping -- that's a job for the G-man, isn't it?" "They're working on it," Jerry said, "And so am I. If I can show that Silvio was taken across the state line, the G-man will be able to get on the job in a really big way." 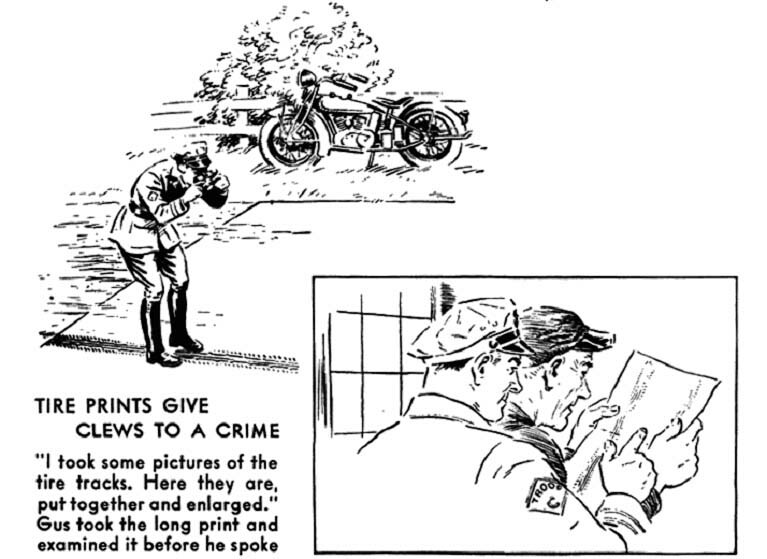 From his breast pocket the trooper took three small rolls of stiff paper. "Remember that road that Silvio lives on, Gus?" he asked. "About a half mile this side of his house there is a short stretch of cement road. Well, I told you there were tire tracks in front of Silvio's house. I picked up those same tracks where the cement road starts, and I took some pictures of them -- the sticky black mud on the tires made that easy." He spread out one of the rolls, and handed it to Gus. "Here they are -- pieced together, and enlarged. What do you make of them?" Gus took the long, narrow print under a drop lamp, and examined it for a couple of minutes before he spoke. "All I can make of it," he said at last, "is that the car wasn't steering properly. It was shimmying -- there was so much up-and-down vibration of the front wheels that sometimes they were right off the road. Oh, yes -- and the driver kicked his brakes on hard." Jerry handed him another print. "How about this one?" "Same tires," Gus said after as intent examination. "But the car wasn't shimmying. It was wandering -- you know, tending to weave from one side of the road to the other." The trooper nodded. "This is what those pictures prove," he said. "That car was driven from Silvio's house onto that stretch of cement road. When it got there, its first wheels were shimmying. The driver stopped the car suddenly. Then he went on again -- but now his front wheels were wandering. What I've got to know, Gus, is what happened to stop the shimmying and start the wandering?" For a good three minutes no one said anything. Then Gus asked; "Do you know what caster is, Jerry?" "I think I do," Jerry said, "But you tell me, professor!" "Well," Gus said, "you know how a furniture caster is don't you? -- with the center of the wheel set off the line of the pivot, so that no matter in what direction you push a piece of furniture, the caster will turn and follow the line of its pivot. To make any automobile steer properly, they have to get the same effect in its front axle. The do it by tilting the axis when the mount it on the front spring,. Road conditions, and the amount of weight the car is carrying, cause frequent changes in the curvature of the front spring, and these changes result in changes in the caster angle. When these changes in caster angle go beyond reasonable limits, they affect the steering of the car. Too little caster causes shimmying. "Now, Jerry, what you want to know is what happened to the kidnap car while it was standing still, to stop it shimmying and start it weaving. Only one thing could have done that. A considerable weight must have been taken out of the car. Removing that weight decreased the caster enough to make the front wheels wander and weave when the car was started." Jerry grinned. "That's what I wanted!" he exclaimed. "Silvio weighs close to 300 pounds. Probably two men were guarding him -- say they weighed 150 each. That makes 600 pounds. Would that be enough to change the caster, Gus?" "It might," Gus assured him. The trooper handed him the third print. "Nothing on this," Gus said. "Different tires -- almost new. Steering O.K." "Those are the tracks of a car that was standing at the side of the road," Jerry said, "The other car stopped beside it. Then this car went on -- headed for the state line, only ten miles away. That'll be enough to satisfy the G-men! I think I know the fellow who drove the first car -- we've got plenty on him. Now I'm going to check up on his car." 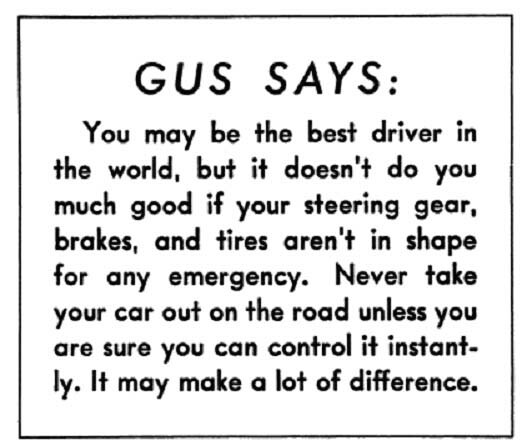 "The chances are about fifty to one," put in Gus, "it will have weak front springs." "Thanks, Gus!" Jerry said, starting for the door. "I'll be seeing you!" "Now that I've finished that piece of second-hand sleuthing," Gus grumbled, "maybe I can get busy on that job of Mrs. Miller's. She won't admit it, of course, but she had run into something good and hard -- probably into another car, while she was trying to park or unpark in a tight place. The Pitman arm is bent so badly that her front wheels have a noticeable cut to them even when her steering wheel says that the car is going straight ahead. Naturally, she's been having a little trouble with her steering!" "We don't get many steering gear jobs any more, do we?" Joe observed. "I remember, when I was a kid, steering knuckles were always breaking, and putting people into the ditch or up a tree." "Yes, I remember that, too," Gus agreed, getting down to business on the Miller car. "And I remember having a steering knuckle break. I wasn't going very fast, but I'll tell you that it wasn't a nice feeling. Well, they don't break nowadays. That's something that the automobile industry learned from racing -- how to make steering knuckles that won't break. "No, modern steering gear parts seldom break, and the gears don't very often get very seriously out of adjustment. Once in a while, of course, you find a cracked bearing in a worm gear. That's because car owners -- and some service station men -- sometimes forget that the moving parts of a steering gear, like any other moving parts of a steering gear, like any other moving parts of an automobile need lubrication now and then. But usually a driver realizes that his steering gear needs lubrication before anything even that serious happens to it. When the gears in the steering wheel column get dry there's a constant drag that even the most careless driver is likely to notice. "When a fellow comes in here and says his car isn't steering right, I check up on a lot of other things before I start checking his steering gear. "First of all, I take a good look at his tires. You'd be surprised how many drivers -- even old-timers -- think that their steering gears have gone wrong when the trouble is in their tires. One tire carrying twenty-eight pounds of air, while the other three are carrying thirty-two or thirty-five pounds, will set up a vibration that will make a car shimmy when it gets up to thirty-five or forty miles an hour. The car will keep pulling to one side, wander or weave, and steer as hard as the very devil going round a turn. Under-inflated rear tires nearly always cause wandering. "Then there are unbalanced front wheels. A two-ounce rubber patch on a vulcanized tread sometimes causes enough shimmy to bounce a wheel right off the road. And then there are wobbly wheels, they're usually the result of springing the wheel out of line by hitting a curb. "Well, if the tires and the wheels seem all right, I check the alignment of the wheels -- measure the angles of caster, camber, toe-in, and so on. Then I check the inclination of the king-pin, and the tracking of the rear wheels. If that's all O.K., I begin to admit to myself that maybe there's something wrong with the steering gear. "Sometimes some part of the steering system is adjusted too tightly or not tightly enough. Too much tightness will cause hard steering around turns, and sometimes wandering; too much play nearly always will cause wandering. If the bad adjustment is in the steering gear itself, it usually is easy to locate. If the gear is too loose, you get a wobbly sort of feeling as soon as you give the steering wheel a twist; if it is too tight, you get a stiff, binding feeling. "In modern steering systems -- especially on cars that have independently sprung wheels -- the various arms and rods that connect the Pitman arm with the steering knuckles are more likely to need adjustment than are the gears in the steering column. Especially the tie-rod ends -- there are four of them, two connecting the tie rods with the steering arm near the center of the car, and the other two connecting the tie rods with the steering knuckle arms, out near the wheels. When they work loose, they cause shimmying. The tip-off is a rattle, usually out toward the wheels, but sometimes at the connections to the steering arm." Mrs. Miller had driven her car away, and Harry had gone home, when Gus heard the office telephone ring, and then his partner's voice answering the call. A minute later Joe Clark put his head in at the shop door. "That was Jerry Corcoran," he reported. "He says that the G-men have found Scarpati -- in a hide-out thirty miles over the state line. The fellow Jerry was after confessed. Jerry says that you deserve all the credit -- the thug thought that he was clean because they had switched Silvio to the other car, but when he was told how and why his car had stopped shimmying and started weaving, he spilled the beans." "Swell!" Gus said, "I hope that they promote Jerry to captain, or something." "So do I," said Joe. "If they raise his pay, the first thing he'll do is buy a car. And if he buys a car, the Model Garage will get his business." “You're a mercenary," Gus said.